Get some historical perspective at Rock Church and Helsinki Cathedral. 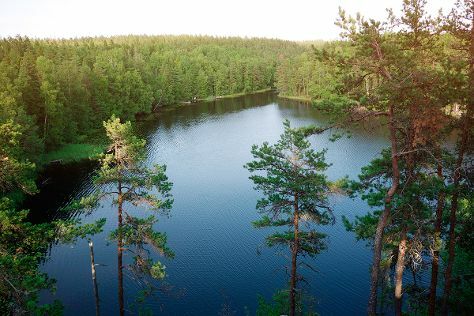 Take a break from the city and head to Nuuksio National Park and Teijo national park. Venture out of the city with trips to Sipoonkorven Kansallispuisto (in Vantaa), Arboretum Mustila (in Elimaki) and Niivermaki Nature Conservation Area (in Kouvola). There's lots more to do: explore the historical opulence of Sea Fortress Suomenlinna, look for all kinds of wild species at Riverside Park, cruise along King's Road, and make a trip to Senate Square. To find photos, other places to visit, maps, and other tourist information, read Helsinki trip planner. If you are flying in from United Kingdom, the closest major airport is Helsinki Vantaa Airport. In September, daily temperatures in Helsinki can reach 19°C, while at night they dip to 8°C. Wrap up your sightseeing on the 16th (Mon) to allow time to travel back home.